Summer is the season of the flower and garden shows starting with the RHS Chelsea Flower Show and many of us will have seen pictures of the show gardens on television, if not in person. 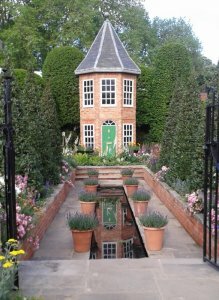 Not to worry if you missed it, there are plenty more shows, local and national, coming up in the next few months where highly designed, temporary ‘gardens’ are created to tempt you. Whether they tempt you to make a few considered tweaks, embark on a total makeover or throw in the trowel altogether rather depends on how well you appreciate the role of show gardens and how they differ from ‘the real thing’. Lovely as a show garden but is it practical as your whole garden at home? So what is the difference? As you probably know, in a temporary show garden none of the plants are actually planted; they remain in their pots which are then covered with a layer of compost or cocoa shells, making a sort of raised bed. This is entirely practical and not really cheating but it does mean that plants are packed in much tighter then you would plant at home to give an unrealistically dense and flowery effect. Secondly, plants are brought into flower earlier or held back later than natural so that everything is performing in show week. Again the effect is superb but not one you can repeat at home. The plan combinations are based on visual impact, in reality the plants may not like the same conditions and not grow to the same size. So is it worth looking at show gardens at all? Yes definitely. Show gardens are there to inspire you, to reveal what beauty can be achieved with paving and plants, to surprise and to expand your garden horizons. Do you have to like them all? No. Will you always come home with a few ideas to enhance your own garden? I do hope so. Show gardens are there to mirror the best of what garden design can offer, they are not there to mirror the practicality of our own outdoor spaces. Visit the shows, watch the TV coverage, read the magazines and visualise your ideal garden. Then have a cup of tea and make one of those ideas a reality. You never know what is possible until you try. If you want a garden with colour all year round, not just for a week long show, check out the Year Round Garden topic in my Gardening by Design Box of Tricks.